I felt at the start of the project that debt was like a mountain and I had a teaspoon. Now it feels like a mountain range! And the highest mountain in view at the weekend, and percolating since then, has been the issues raised around unjust debts, both sovereign (nation-based, institution-led) and household. 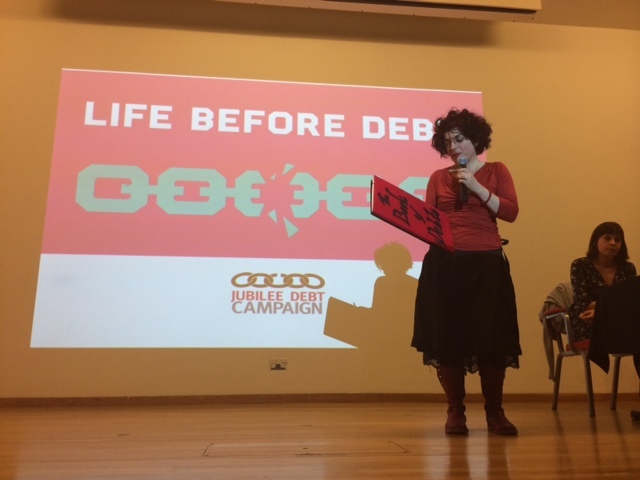 I have spent a few years now wondering how to get past and shift the perception of debt as merely a financial issue, which can be a barrier to engaging with the project on first sight (I don’t owe money, or if I do I’m not telling you about it – I’m not guilty!arg!). Now, finally I was in the company of 400 other people who not only take the broader social, moral, political, psychological context of debt deeply seriously, but also have a lot of specialist knowledge of it. The emphasis was of course on economic justice and ways to work towards this, so this post focuses on what came up and struck me most on that front, and uses the language of that sector, which is dramatic, and provocative (and rightly so). Yes, there was plenty to be depressed about. Debt peril, debt slavery, financial colonization, mounting household debt and mental health statistics. But also it was an amazing space for gathering intelligence, feeling others commitment globally to work on a collective change and there were a number of solutions which came up too. At the closing, the incredible Njoki Njehu, grassroots organizer, ecological activist and women’s advocate of Jubillee South, gifted us with the story of the hummingbird gathering raindrops to help put out the forest fire, (see clip here), which was a really good tale to take away for mitigating what could feel like an insurmountable task ahead for those engaged in challenging the fundamentals of the system, such as the way money is created – like the extraordinary Ann Pettifor who just published ‘Just Money’, another for my list to read..) . Or just for facing and dealing with what is happening right now in society and how to approach and be gentler with one’s own self-expectations. As the keeper of a Book of Debts, at this time in history, I need to hear more poetic nuggets like this, to avoid overwhelm and to remind myself in my own small but focused role in opening up dialogues with those I meet through the project and who engage with it on whatever level. There will be a film edited from the day, which I will link to when it’s up and will do a far better job than I can of capturing the day..
At the opening he picked up on the questioning by Rowan Williams (former Arch bishop of Canterbury and author of some excellent speeches and articles on economy and morality) of the ‘we should always pay our debts’ morality (or psychological patterning) around debt which enables irresponsible lending to take place, lenders to remain silent and our entire system to now be built apon debt, with – as his students put it ‘ Our futures foreclosed’ . Nyoki Nyehu, questioned the concept of forgiveness – and charity – in relation to socio- economic, unjust or odious debts. They said it should be a no-no in this context as this implies there is something to forgive, a negative value, setting up a hierarchy, as then if your debt is forgiven, you owe the person who forgives you It is not empowering and it adds a layer of indebtedness and the idea of payback. We could explore this is other areas of human behaviour and relationship too. They suggested the same could be said of charity (my Caritas ears pricked up!) ‘Charity suggests a judgement about the moral worth of the individual – that they need to be in need to be helped’ i.e. those humans don’t have automatic right to the basics of life. I want it look at this more. ‘Do not seek profit from another’s misery’ i.e. don’t manage lending to someone in such a way as to deprive the debtor his or her essential survival. He talked about the spiral of asymmetry re debt and credit and that all we can do are ‘limit the spiral’. He also mentioned the prohibitions of unlimited collateral, i.e. ‘Don’t take as security for a debt something that someone else needs, that is, don’t take the cloak that covers the back’ So then I thought of course of St Martin.. That will come later too, as I draw on this for my Isle Perdu Amiens commission. My head is spinning simply writing these words. So time to gather some raindrops and check The Book of Debts, which just launched at Fabrica, Brighton until May 22.